The Mount Saint Agnes Academy [MSA] Bazaar Country Fair is taking place today [Oct 13] and tomorrow [Oct 14], from 10.00am to 10.00pm each day. 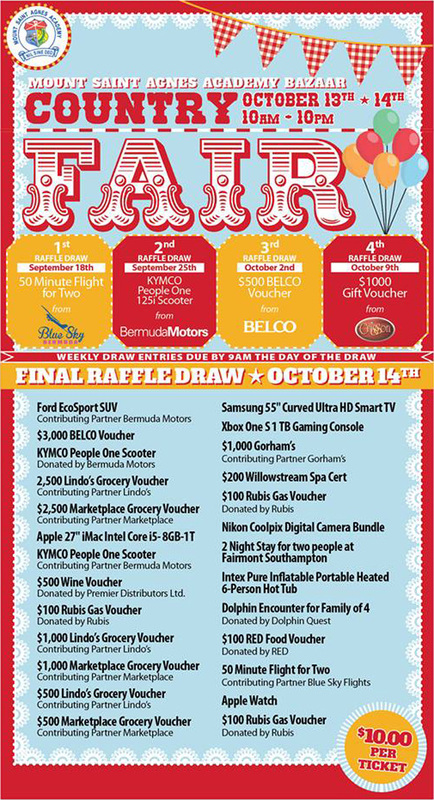 A spokesperson said, “The MSA Bazaar has been Bermuda’s favorite family fun event for over 100 years! Committed to providing Bermuda’s families with an unforgettable experience every year. “This years theme is Country Fair and is designed to bring the past and present together and create a fun atmosphere where everyone can enjoy. “We have raffles for major prizes, a Kiddyland for the little ones, baked goods for the sweet tooth, superslide for the thrill seeker and plenty of games to try your hand at for winning a prizes. “This year we’ll be introducing another new and exciting game called Megawire the ultimate test of patience, whole body steadiness, and hand-eye co-ordination, so pop by and see if you can navigate to the end without settng off the buzzer. If you didn’t get a chance to try our Skee Ball machines last year, don’t miss out again this year. “Bingo is a favorite for many and this year we have upped the anty on the prizes. There will be Black-out Bingo on Friday and Saturday night, both at 9pm. “Friday nights prize will be a 32″ LED TV with an Apple TV and Saturday’s a 60″ Sony LED TV. This year you’ll be able to see what prizes we have for each Bingo set in advance so keep an eye on our Facebook page and website for additional details.